Altenergy.org has an excellent article on micro parallel inverters, which gives a good description of inverters in general at:micro parallel inverters. The Context SW 2524 Inverter/Charger gets good reviews on its versatility. It is also simple to install and very competitively priced. The Conext SW 2524 will charge your battery bank using the grid, a gas powered generator, or your solar, hydro, or wind energy sources. The mounting bracket is designed for studs spaced 16 inches apart, and the wiring hooks in on the side, making for easy access and connections. It is compatible with a variety of battery banks, including FLA and Custom batteries, and you can customize your unit using the control panel and a Combox, which will also remotely monitor the system over the web. This Inverter/Charger is also stackable. A single unit provides an output of 4 kW, and adding a second one allows for up to 8 kW. There are two versions of this device, one for North and some of South America (a 120/240V split phase) and one for Europe, Australia, Africa, and some of South America (230V single phase). It can operate at 50Hz or 60Hz making it useful in unique markets, such as Jamaica's 110V 50Hz and Asia, where electrical standards vary quite a bit, depending on your location. Before installing a Conext SW inverter/charger, know what your power requirements are. Inverter/charger power systems generally involve one DC source, one AC source, one inverter/charger, and a control/monitoring device. Inverter power systems vary depending on the power requirements and where the user is located. An off the grid house with an AC generator, a battery, and a Conext SW inverter/charger with a System Control Panel (SCP), is one example. A house in the city, connected to the power grid, and requiring a backup system to cope with rolling blackouts, is another example. And then, there is the ideal of capturing and storing renewable energy such as solar, wind, and hydro energy, for future use. When choosing a location for the inverter/charger, it should not be installed near water or other fluids which could drip or splash on it. It should be protected from the environment, including rain and snow. A normal ambient air temperature between 0 °C and 25 °C (32 °F and 77 °F) should be maintained. It should be close to the battery bank, but not in the same compartment. The length and size of your DC cables will affect performance. (Shorter is better, as direct current, unlike alternating current, loses voltage quickly based on distance.) The inverter/charger should not be installed in the battery compartment because of the possible presence of explosive hydrogen gas from the batteries. Give the inverter/charger as possible as much space around it as possible. It is strongly recommended other objects and surfaces should be at least 250 mm away from the ventilation openings for the best performance. The Conext SW inverter/chargers provides a variety of multiple unit configurations. This gives you (and/or the installer) more options to work with when designing a system to meet your load demands. Multiple inverter/chargers of different power levels can be installed in a system as a standalone, or in parallel.In a multiple unit configuration, only two Conext SW inverter/chargers of the same model can be used. Two Conext SW 4024 230 units can be configured/stacked because both units have a 24-volt rating and a power rating of up to 3500 watts. With this configuration, the inverter/charger capabilities of a system are doubled. 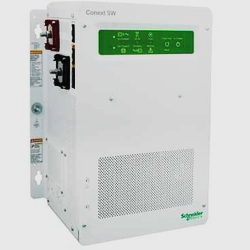 If two Conext SW 4024 230 units are being used, the inverter power rating doubles to 7000 watts and the charging output current doubles to 180 amps. But, the AC transfer relay rating of 30-amps remains the same. Two inverter/chargers can operate from different battery banks, meaning each unit is connected to its own battery bank. The battery bank size, or capacity, is just as important as the type of battery. The batteries are very important part of your system. Consequently, it is recommended you purchase as much battery capacity as possible. A large battery bank will extend running time and ensure your inverter/charger delivers its full rated surge. You should have a minimum battery bank size of 100 amp-hours (Ah) for moderate loads (1000W) and more than 200 Ah for heavy loads. There are different standards used in rating battery energy storage capacity. Amp-hour capacity is typically used for inverter/chargers, and represents the number of amps a battery can continuously deliver during a specified number of hours. It is expressed by the product of the two, or amps times hours. A battery bank rated at 100 Ah can deliver 5 amps for 20 hours (5 amps × 20 hours = 100 Ah). This same battery bank can also deliver a lower or higher current for more or less time. All in all, the Context SW 2524 Inverter/Charger is a very good deal at the present. I would like to see it become a little less expensive (dream on), but considering how well it’s designed, it does seem to be worth the money.